After 20 years as a stroke play event, the NGA has announced that the 2015 TPC will be played at match play. The field of 8 players will play 7 round robin 9-hole matches, with the top 4 in the points playing 3 additional matches to decide the champion. In less than 4 months, we will all be meeting in Southern Pines, NC for playing of the twenty-first TPC. Although only an 8 player field, this allows for something we’ve always wanted to do, play TPC as a match play event. Over the first 63 holes (3.5 rounds), each player will play a 9 hole match against another, with everyone playing everyone one time. Each match will be played over 9 holes, with each hole worth 1 point and each match 9 points. The total amount of points available is 63. Since the matches are point based, every hole is worth something; there are no close-out or dormie situations. After 63 holes, the top four in total points will be placed into the championship bracket, where as the bottom four are placed into the consolation bracket. Over the final 27 holes (1.5 rounds), each player will play a 9 hole match against another in their bracket, with everyone playing everyone one time. All point totals are reset for the final three matches. Just as before, each match will be played over 9 holes, with each hole worth 1 point and each match 9 points. The total amount of points available is 27. The player with the most points in the championship bracket with be declared our TPC champion. 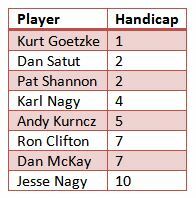 Since we will be playing match play, the option to concede a hole or give a putt is possible, however those wanting to post an 18-hole score will also have that option. This format may be new to TPC, but there is no more enjoyable way to play golf than at match play. I look forward to seeing everyone in Southern Pines very soon.